Throughout the centuries, the concept of the “march” has played its part in shaping history. There’s the Jarrow March, the Chinese Red Army’s Long March, the March of the Hebrew Slaves, Gandhi’s Salt March and the Aldermaston Marches, to name but a few. On December 6, 2014 in Hitchin, a quiet, unassuming town in Hertfordshire, a procession will take place to protest about the possible loss of the club’s historic Top Field football stadium – for the die-hards of the Canaries, it is the most important step-out they are ever likely to participate in. Hitchin Town’s Save HTFC march is aimed at being much more than a group of football fans making a stand against the development of their ground. The plan is to install a supermarket on the site of Top Field (rumours abound that it is not Tesco anymore, given recent developments at the company, but a German discount chain eyeing the Fishponds Road plot) and move the club to an out-of-town site that is far removed from its leafy home of wood and corrugated metal. This has ignited the emotions of a number of worthy bodies within the old market town such as the Hitchin Society, the Hitchin Forum and the town centre management office of the Hitchin Initiative. The football club is aware that without the support of the town, it does not have the critical mass to make its campaign really count. So, as far as the club is concerned, it is also about “saving” Hitchin and also preserving the green belt land where the new ground will sit. As it currently stands, it looks as though that will reside on its own on the busy and treacherous highway out to Stevenage, but there are plans for 8,000 houses on the stretch between Stevenage and Hitchin and a new road. The football ground is part of that new sprawl. Green belt discussions, needless to say, are far broader than a football venue. However, planning experts consider that the placement of a supermarket on prime town centre territory will not get over the hurdles it faces, and that the new ground may also face significant obstacles, so it’s far from being a done deal. The question is, can commercial Hitchin survive another supermarket? The town centre, for a long time an attractive combination of niche shops and a thriving market, has already received a number of body blows to its economic vitality. The fear is that another supermarket will siphon more people out of the centre and position Hitchin as a candidate for a Mary Portas makeover. The very thing that has attracted people to Hitchin, and helped inflate property prices, could be at stake. The pressure is building and even casual onlookers would be impressed by the intense level of activity at the club at the moment. But it needs help from the wider community, largely because the club’s followers are not spring chickens, or rather young canaries. The issue of the ground has been an ongoing debate for decades. The latest tabled ground plan is merely the latest in a number of proposals that go back to the early 1960s. Some supporters have long given up any hope of a new ground or redevelopment that will bring the club into the 21st century. And to think, in the mid-1930s, the Hitchin chairman boasted that one day, the Canaries would have a ground that would match the mighty Arsenal’s Highbury Stadium! Key to it all is how the club’s landlords, the Cow Commoners, react to what might be a torrent of negative reaction from the town. – at least, that’s what Hitchin Chief Executive Andy Melvin is hoping. The trust that has seemingly mishandled and misunderstood the club’s place in society is clearly feeling the strain – the chairperson, who received considerable abuse when she spoke at the recent public meeting, has resigned and there have been rumours of divided opinion among the Cow Commoners over the future of the football ground. A lot of people are pointing to these self-elected trustees and questioning whether they have performed their duties in the best possible way. Meanwhile, the club’s loyal volunteers and officials are bracing themselves for one of the most vital periods in the history of Hitchin Town. Much depends on how many people turn out to support the march on December 6. It will allow the club to more accurately gauge public feeling, both for Hitchin Town and for the economic and social fabric of the town itself. Parked firmly in the back of their mind is the thought of a poor turnout that pulls the rug from underneath the campaign, or at least sets it back. Expectations have to be managed, though. The target of 2,000 – 3,000 people may be a little optimistic (population of Hitchin is around 35,000) but 500-plus would send a strong and clear message and certainly congest the town on a Saturday morning and make the cause visible. Who would want to be a Cow Commoner if a town the size of Hitchin holds you responsible for destroying the local economy? 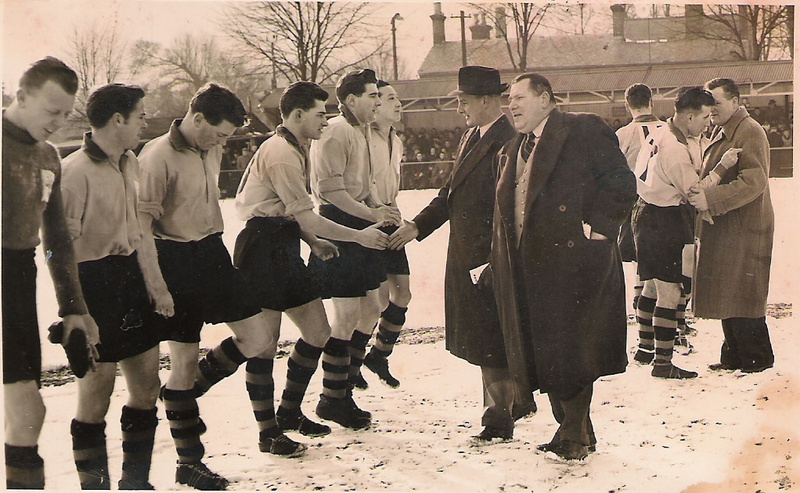 People like club secretary Roy Izzard, who cannot comprehend anything but success for the club he has followed man and boy, will be anxiously watching the weather forecasts for December 6 – and not because of a possible pitch inspection.